This article reports on the use of a natural tooth crown to repair substantial defects caused by caries. A 50 y old woman wished to have a mandibular left-side third molar extracted. Concurrently, the patient voiced concerns about the metal collar of a premolar. It was decided to extract the third molar and to use this tooth to perform an autologous tooth crown transplant at the upper second premolar. The left third molar of the lower jaw was extracted and stored in physiological saline. The tooth root was then cut at the cement-enamel junction, and the tooth crown width was adjusted by cutting to approximately-1 mm from the first premolar distal contact to the first molar tooth mesial contact. The inside of the crown was adjusted so that the abutment would fit inside the crown. An industrial resin impregnation technique was then applied. Composite resin was built up on the inner surface, margin, and the distal surface of the transplant crown, thus fabricating the transplant crown. The present case demonstrates that fabricating a transplant crown using a crown from an extracted tooth, and using composite resin and an industrial resin impregnation technique to transplant the crown, is feasible. At the six-month follow-up evaluation, the patient continued to exhibit a favorable outcome; nevertheless, further long-term follow-up evaluation is needed. Metal-free dental restorations are increasingly used for medical and esthetic reasons. Medically, the use of metals in dentistry poses biological risks because they may cause metal allergies and metal ion-induced oral pigmentation . Esthetically, increased demand for a more appealing cosmetic appearance has increased the use of metal-free restorations, even in the posterior region . Esthetic restorative materials are broadly divided into two categories-resinous materials and inorganic materials-with the latter including porcelain and castable glass ceramics; however, both types of materials have advantages and disadvantages. From a material point of view, it has been noted that resinous materials are softer than the natural tooth structure, while inorganic materials are too hard to be biocompatible with natural teeth. Thus, it is believed that no artificial material is superior to natural teeth. The reuse of natural teeth was reported by Santos and Bianchi , who described enamel inserts in composite resin restorations, and the reconstruction of cusps with selected portions of tooth material. To date, however, crown forming has not been reported. On the other hand, an industrial technique known as resin impregnation has been reported. Resin impregnation is used to enhance porous products, such as concrete, cast products, and paper [4-6]. A vacuum device is used in this technique, and is useful for thorough resin infiltration and strengthening purposes. We focused on the tubular structure of dentin and have attempted to use this technique for strengthening transplant crowns. We report on the fabrication of a transplant crown using this resin impregnation technique. A 50 y old woman presented in May 2016 with a mandibular left-side third molar that she wished to have extracted (Figure 1). Concurrently, the patient voiced concerns about the metal collar of a premolar. It was decided to extract the third molar because the tooth did not have an opposing tooth, and deterioration of the intra-oral environment was expected. The extracted tooth was used to fabricate an autologous tooth crown transplant to be used at the upper second premolar (Figure 2). Figure 1: The third molar on the left side of the mandible intended for extraction. Figure 2: An autologous tooth crown transplant performed on the maxillary right-side second premolar. After the metal crown and resin core were removed from the premolar site and a fiber-reinforced resin core (Fiber Post N, GC, Tokyo, Japan; Clearfil DC Core Automix, Kuraray, Tokyo, Japan) was implanted, an abutment tooth formation was prepared with a round-shoulder finish line and an inverted roof-type occlusal surface configuration (Figure 3). Approximately 7 mm of clearance was secured. An impression of the die was made using polyvinyl siloxane impression materials (Exafine putty type, GC Corp, Tokyo, Japan; Tosicon Pastel Regular, Dentsply, Tokyo, Japan) and a two-step impression technique, thus creating a working model (Figure 4). Figure 3: Completion of tooth preparation and abutment construction. Figure 4: Abutment of the working model. A: Buccal surface. B: Occlusal surface. C: Clearance from the opposing tooth. The left third molar of the lower jaw was extracted and stored in physiological saline (Figure 5). The tooth root was then cut at the cement-enamel junction and tooth crown width was adjusted by cutting to approximately-1 mm from the first premolar distal contact to the first molar tooth mesial contact. The inside of the crown was adjusted so that the abutment would fit inside the crown (Figure 6). Figure 5: The left third molar of the lower jaw is extracted. A: Lateral surface. B: Occlusal surface. Figure 6: Adjustment of the transplant crown. A: Cut line. B: Width. C: Interior of the crown. After the transplant crown was dried at room temperature for one week to remove moisture, immersion was performed under low vacuum conditions (-70 kPa). A one-step adhesive (Beautybond Multi, Shofu, Kyoto, Japan) was used as the resin impregnation liquid. The vacuum pump used in the present study and a schematic diagram of the immersion device are shown in Figures 7 and 8, respectively. Air holes were created in the cap of the vial containing the bonding resin using a steel rod. Dental floss was fixed to the crown occlusal surface using a laboratory adhesive and passed through the air holes in the cap to prevent the tooth crown from making contact with the bonding resin. The vial was embedded in alginate impression material in a vacuum cup while pulling the dental floss to prevent the crown from being dipped into the bonding resin. The cap of the vacuum cup was then closed. The tooth crown was left for 1 min in a nonimmersed state in the bonding resin under low vacuum conditions. The dental floss was then pulled from the vacuum cup and the tooth crown was immersed in bonding resin for 1 min. Normal atmospheric pressure was restored and the specimens were immersed for 5 min. The crowns were then removed and light curing was performed for 1 min. The immersion step used is illustrated in Figure 9. Figure 7: Vacuum hand pump (MV8000, Lincoln Industrial Corp. St. Louis, MO, USA). The hand pump is used to create a vacuum in the cup. A: Vacuum pump. B: Vacuum cup. 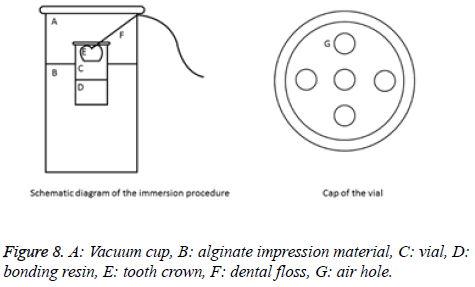 Figure 8: A: Vacuum cup, B: alginate impression material, C: vial, D: bonding resin, E: tooth crown, F: dental floss, G: air hole. Figure 9: Immersion steps in resin bonding. Petroleum jelly was applied to the surface of the working model abutment. Thereafter, composite resin (Clearfil Majesty ES-2, Kuraray, Tokyo, Japan) was built-up on the inner surface, margin, and the distal surface of the transplant crown. The adjacent tooth and the marginal ridge were combined, and then light irradiated for 2 s, before the transplant crown was removed from the working model. Light-curing for 2 s and detachment from the working model were repeated until the composite resin had cured (Figure 10). 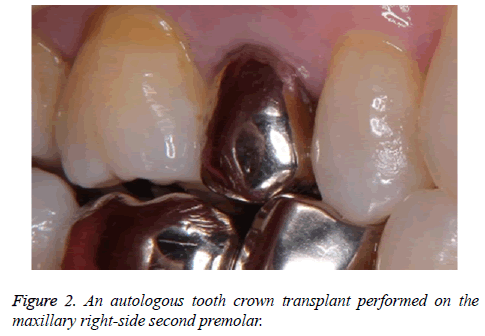 Figure 10: Fitting of the transplant crown with composite resin. A: Buccal surface. B: Occlusal surface. Excess resin was removed from the transplant crown using a high-speed diamond bur, and the shape was modified and caries were removed (Figure 11). The occlusion was adjusted to achieve slight contact, with maximum intercuspation and lateral movement. The complete transplant crown is shown in Figure 12. Figure 11: Modification of transplant crown morphology. Figure 12: Completion of transplant crown. A: Buccal surface B: Occlusal surface. Adjustment contacts and adjustment occlusion were performed before cementing, which was performed using Super-bond (Super-bond, Sun medical, Shiga, Japan). An intraoral photograph after cementing is shown in Figure 13. After cementing, the patient continued to exhibit a favorable outcome at the six-month follow-up evaluation (Figure 14). Figure 13: Transplanted crown after cementing. A: Buccal surface B: Occlusal surface. Figure 14: A and B: Six-month follow-up evaluation revealing stable clinical performance of the transplanted crown. In recent years, there has been increased interest in the socalled concept of “minimal intervention dentistry”, which involves new techniques for treating dental caries with less surgical invasiveness. It has been suggested that no material has yet been developed that is superior to the material comprising natural teeth. From this perspective, it appears reasonable to transplant crowns obtained from a natural tooth to repair a defect in another tooth. Accordingly, we attempted an autologous tooth crown transplant. In addition, we applied an industrial resin impregnation technique to transplant a crown. The resin impregnation technique is used in various industrial applications. A crack in concrete may be repaired by injecting epoxy resin [4,7,8]. In addition, blow holes may be filled by injecting resin, thereby strengthening the cast product [5,9]. Resin-impregnation supplements mitigate the disadvantage of the inability of paper to withstand humidity . A vacuum is applicable to these steps and promotes the penetration of resin into cracks. A vacuum is used with the resin impregnation technique in industrial settings and involves the principle of Boyle’s law (i.e., the volume of a gas varies inversely with pressure) . The effects of the resin impregnation technique on teeth may be elucidated in future research. Previous studies have attempted to expand the reuse of tooth crowns, in which donor teeth have been milled using the CELAY system (Mikrona Technologie, Spreitenbach, Switzerland) and the inlay produced . The present case demonstrates that fabricating a transplant crown from an extracted tooth, and using composite resin and an industrial resin impregnation technique, is feasible. The six-month follow-up evaluation revealed that the transplanted crown was stable; nevertheless, careful long-term evaluation is necessary. If long-term stability of such transplanted crowns can be confirmed, reuse of human teeth may extend their range of application(s). The present case demonstrated that fabricating a transplant crown from an extracted tooth, and using composite resin and an industrial resin impregnation technique, is feasible. At the six-month follow-up evaluation, the patient continued to exhibit a favorable outcome; nevertheless, further long-term follow-up evaluation is needed. Wataha JC. Biocompatibility of dental casting alloys: a review. J Prosthet Dent 2000; 83: 223-234. Tsitrou EA, Northeast SE, van Noort R. Evaluation of the marginal fit of three margin designs of resin composite crowns using CAD/CAM. J Dent 2007; 35: 68-73. Santos J, Bianchi J. 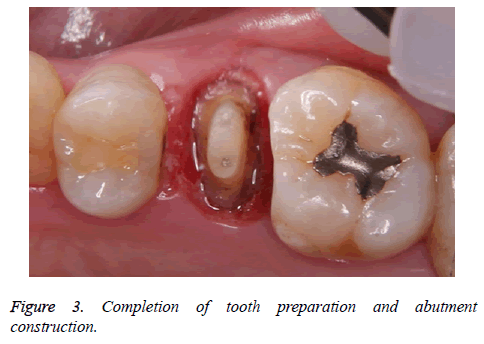 Restoration of severely damaged teeth with resin bonding systems: case report. Quintessence Int 1991; 22: 611-615. Goto M, Tsuchida Y, Sawamoto T, Jitozono H. A study on compressive and tensile strength of concrete repaired crack by injecting epoxy resins. Bulletin of Institute of Technologists 2011; 2: 42-47. Ogasawara T, Otani K, Maki K, Ishibashi A. Effect of acrylic resin impregnation on machinability of sintered alloy steel for engine valve seat. Transactions of the Japan Society of Mechanical Engineering 1997; 63: 2872-2877. Hayashi J, Inoue M, Shimizu Y, Takai M. Biodegradability of papers reinforced with resins. Soc Polymer Sci 1993; 50: 863-871. French CW, Thorp GA, Tsai WJ. Epoxy Repair Techniques for Moderate Earthquake Damage. ACI Structural J 1990; 87: 416-424. Moriconi G, Pauri MG, Percossi G, Busto S. The influence of injected epoxy systems on the elastic and mechanical properties of cracked concretes. ACI Spec Publ 1991; 128: 233-248. Okimoto K. Machinability of resin impregnated sintered iron. Trans JSME 2008; 74: 260-266. Tezuka Y, Asakura K, Nakamura S, Sasaki M. The method to visualize minute cracks of concrete core sample by using fluorescent epoxy resin Fchitahou. Proceedings of Hokkaido Chapter of the Japan Society of Civil Engineers 2005; 61: 5-10. Moscovich H, Creugers NH. The novel use of extracted teeth as a dental restorative material-the Natural Inlay. J Dent 1998; 26: 21-24.